Hints for choosing a dehumidifier -Compressor or Desiccant? If your home suffers from mould and condensation mainly in warmer climates after heavy prolonged rainfall (typical temperatures above 15degC) and high humidity, choose a compressor model dehumidifier. Heat 1-3 deg warmer than ambient temp. Mould is a type of fungi that live on plant and animal matter sending tiny roots into the surface upon which it grows. It grows on most surfaces and is often associated with damp, musty smells and is generally found everywhere, including bathrooms, basements, bedrooms and storerooms to name a few. Mould travels through the air as tiny spores which like to make their home in moist areas, where they will breed. If mould is spotted, it's best to nip it in the bud immediately to avoid it spreading to other areas. It's also a good indication of a moisture problem, which should be dealt with as soon as possible. Mould spores are everywhere all the time, entering from the outdoor air as well as on pets and clothing. A mould spore landing on an indoor surface is likely to be insignificant and amount to little more than a common component of indoor dust, until such a mould spore lands on an organic surface, and with the indoor humidity rising above 60%, the moisture level on the surface on which the mould spore rests, becomes sufficiently high. Since a mould spore requires moisture to propagate and grow (just like a plant), the indoor humidity level is a major factor in the control of indoor mould and dust mites in your home. If Humidity (food source) is high (>60%RH), within 48 hours, mould can reproduce itself thousands of times. There are two things and two things only that moulds need to grow. They are food (organic surfaces) and moisture. There are moulds that specialise in eating just about every possible type of organic material. The most commonly found moulds indoors are Aspergillus, Alternaria, Cladosporium, and Penicillium. When provided with suitable food (e.g a ceiling tile or some drywall) and moisture in the form of very high humidity, condensation, or water from a leaking pipe, these generate fungi and will gladly set up housekeeping and begin to grow. Use your eyes and nose to find moulds in the home. If you can smell a mouldy, musty, or earthy odour; mould is present and needs to be dealt with. What can you do to combat and prevent mould from returning? Remember: Prevention is always better than Cure, don't wait for the problem to occur... prevent it happening! How to prevent and treat it. All our Mould prevention products can be fogged and sprayed via our Fogmaster portable unit. A Dehumidifier will reduce humidity to a safe mould free level, fans can be used to accelerate the process and move the dry air around . Close windows- when it rains, as it is crucial in keeping mould under control, preventing atomised air from entering the room. When the rain clears, reopen the windows to encourage ventilation. Purify the air - An air purifier is helpful in removing mould spores from the air. Minimise the carpeted areas as they are a potential storehouse for various moulds. << In high rainfall areas, avoid cutting into the slope, if it is necessary to cut into land then use a swale or large spoon drain to redirect water away from the home. Remove trees close to the house that block sunlight from walls and windows. Enable good ventilation under your home in subfloor areas. A well placed sealed concrete slab is also ideal. Speak to one of our professional consultants who can guide you through the process. CONDENSATION - What are the usual causes in the home? Poor ventilation in the bathroom & laundry, unvented or poorly installed exhaust fans that vent into the roof cavity causing an excess build up a steam and moisture. Environment-Living in an area with high seasonal rainfall and humidity levels. In winter, a drop in outdoor temperature causes condensation and dampness to form on interior walls, windows, tiled floors etc. Especially when indoor un-flued gas heaters are turned on. Causing an excess of moisture as a by-product of heating gas being burnt. Dew point is reached when warm moist air meets a cold surface such as walls, glass or tiled floors, condensation is the result. Other major causes of excess moisture in homes are leaking pipes, damaged roofing and poor underfloor ventilation. What are some of the ways you can combat condensation and dampness? Using a high air flow bathroom or laundry ceiling fan Kit that is ducted to the outside of the home and not into the roof space. 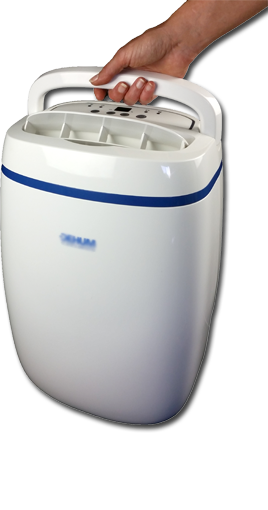 Pedestal or floor fans used in conjunction with a suitably sized dehumidifier creates better air movement for the dehumidifier to collect the moisture and create extra warm whilst drying the air. A great way to solve the damp and musty feel in homes or storage rooms is to install a suitably sized room dehumidifier. ie 8-12L suit single bedrooms - 14-20Lmodels suits 1- 2 rooms -22-28L 2-3 rooms. Dehumidifiers are devices that filter the moist air particles or humidity from the air, condensing the moisture into a container inside the dehumidifier unit, which fills up to a float level that switches off the unit when full. They range in domestic capacity from mini dehumidifier 600ml/day to a massive 120L/day portable commercial dehumidifier, suitable for large open plan warehouses, underfloor storage rooms or several rooms up to 1000sqM. They work well in combination with an air conditioner and are low power and energy efficient devices requiring from just 30W-1000W to operate depending on the size of the dehumidifier. They are also great for drying clothes in the laundry, stops clothes shrinking uses 1/5th-1/10 of the power that a clothes drier or A/C unit would use. Very economical to run. The Dampp Chaser or storage low heater rods Dampp Chaser rods are excellent for closets and wardrobes. Where you can safely set and forget them, they warm the air creating air circulation and a dry barrier for preventing moisture build up in enclosed small spaces. They come in 3 sizes 45cm-61cm-91cm, are used in enclosed cupboards, wardrobes, video or photographic cabinets and create a controlled safe low heat, a warm barrier which rises through the area creating warm air movement, drying all objects in its path. Dampp Chaser cupboard rods range in price from $85-$105. How much do the Dehumidifier devices cost? Prices for cupboard and wardrobe dehumidifiers range from a rechargeable dehumidifier @ $29.95 up to $1300 for the larger 28L/day SeccoProf models Home Office dehumidifier models. For larger Commercial Model dehumidifiers range from 42L/day - massive 120L/day, starting at $2195. Most Dehumidifiers come with a 1-year replacement warranty. Are there any other measures a homeowner can take to combat dampness? Install dehumidifiers in damp problem areas, install Dampp Chasers or mini dehumidifiers in wardrobes and under sink areas. Check for poor underfloor ventilation ie musty and mouldy stale air, rooms above may have mould problems and install specially designed low power underfloor ventilation fans. Install a simple temp/humidity meter that measures the humidity in the air. Over 60-65%RH causes mould to form. This warns you when you need to start up your dehumidifier. Close windows around the home on rainy days and put the fans on. Open up on Dry sunny days. Are there any cases where dampness cannot be solved, and where an entire renovation is required? Extreme cases of moisture occurring in homes usually arises when homes are built into hills and moisture seeps under the home without ventilation. This is usually solved by correct engineering of a home in its planning stages. 90% of cases can be solved or alleviated by using devices mentioned above or by consulting a climate control or dehumidifier specialist. Helping you to prevent and combat mould issues and creating clean, fresh air in your home, office or building. We all want fresh mould free air to breath and the best way to do that is to install the right type of ventilation system. Here are our hints and tips to help you choose the right ventilation system. These can be ceiling wall or underfloor mounted, are designed to draw moist or stale air through a fan and using a suitably sized duct hose, vent it to the outside of your building. They are particularly popular for use in kitchens, bathrooms, laundries, and are now being used for underfloor moisture problems as they can remove moisture from the air as well as odours and stale air. Range hoods are used in the kitchen to vent away smells, greasy air, cooking odours, steam etc. They are mounted over the stovetop and vent to outside usually filtering the air before sending it outside. this just means opening the window at the right time, when there is no rain, (as you don't want moist atomised air to enter) in the desired room to let fresh air come in! By opening windows opposite each other (cross ventilation), you can get fresh air in and flush out stale, old air at the same time. Relatively new in Australia, the concept uses solar energy to operate high-efficiency exhaust fans mounted on the roof or a fan that operates using the suns rays to power a fan that draws in fresh cool dry air then filters it before delivering the air into the home. Filtration removes contaminants and mould spores. Great for children's rooms and asthma sufferers. you need to ask a few questions of the suppliers to be able to get the required system needed for your home office or building. Identify the problem areas in the building that need the extra ventilation. What do you want from the system? Is stale air an issue in wardrobes and cupboards? Is musty mould smells coming from the underfloor or basement area? Do you simply need fresh dry air coming into the living rooms or bedrooms? Do you need to remove musty mould smells and odours? Systems can be simply operated by the flick of a switch or can be set up with sensors to operate automatically when humidity is high. Work out your budget and build on the system over time. Costs will depend on the complexity of the system but there are simple methods and DIY kits available that don't require thousands of dollars.